Sister Frances Elizabeth grew up Waterloo, Iowa with her two brothers and two sisters. The children were very close in age and all attended the Catholic school that was just a few blocks from home. Although they grew up during the depression, they were unaware that they were a “poor family” because of the values that their mother instilled in them. She provided the youngsters with a stable home life that included discipline, healthy food, and the encouragement to read and learn to play a musical instrument. As a result, the word “bored” was never part of their vocabulary. Young Frances Elizabeth was educated by the Sisters of Mercy. These dedicated women provided an excellent education; but even more, they gave Frances Elizabeth a beautiful example of religious life, genuine caring for one another and support to the Schmitz family during times of crisis. As the years passed, Frances Elizabeth felt drawn to religious life and naturally thought of the Sisters of Mercy. During her senior year in high school, one of the Mercy Sisters asked Frances Elizabeth if she had considered entering religious life. She answered affirmatively but added that she had to work and help her family financially first. In a kind response, the Sister commented that she hoped Frances Elizabeth would come to the Mercy Sisters when the time was right. This comment was deeply appreciated by Frances Elizabeth. After working for 2 ½ years, she did enter the Sisters of Mercy and felt she had “come home.” However, at the end of a year, she left the Sisters of Mercy because of a vague and unclear feeling that she did not then understand. Later, at home again, she discussed her vocation with a Franciscan, Father Raphael Grahl. After a long and profound interview, Frances Elizabeth knew with clarity that she had a Franciscan calling. She was received as a laywoman into the Secular Franciscan Order, an interim step! After a visit to the Motherhouse in Springfield, Illinois and a conversation with Mother Magdalene, the Provincial Superior, Frances Elizabeth made the decision to enter the Hospital Sisters of St. Francis. Her entrance date was February 2, 1945. Following her initial formation and profession of vows on October 4, 1947, Sister Frances Elizabeth attended LeClerc College and obtained a degree in History. Thereafter, she returned to the Motherhouse and taught in the Novitiate for seven years. Sister then ventured to Arizona and worked with the Native Americans for two years. Again, Sister Frances Elizabeth felt another call stirring in her heart. After her time in Arizona, she responded to this by testing a vocation to the Poor Clares. While she only stayed with them for seven months, Sister feels that the experience provided an understanding of another branch of the Franciscan Family, and also clarified her call to the Hospital Sisters with its balance between the contemplative and the active life. Sister Frances Elizabeth then immersed herself in the health care ministry and became a registered medical record administrator. She served in Medical Records and moved into general hospital administration in the next few years. 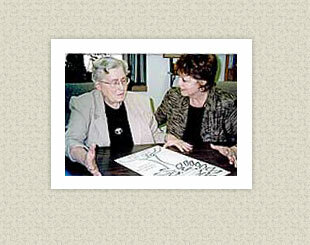 In 1973, she began service in the Community as well as hospital leadership at the Board of Directors level. From 1979-1982, Sister was the Provincial Superior of the Hospital Sisters of St. Francis. After completing her term as Provincial, Sister returned to St. Joseph’s Hospital in Chippewa Falls, Wisconsin and remains there today. She has served in the Development Office, as Coordinator of Spiritual Services, and now assists with the Colleague Mission Integration Program and is the local Community Coordinator for the Sisters in Chippewa Falls. Throughout her Community life, Sister Frances Elizabeth has brought her unique vision of Francis and the Franciscan movement with her and shares it with all those she encounters. She is grateful that her vocation has provided her with an opportunity to be part of the broader Church. This has been enriching to her personally, but no doubt Sister Frances Elizabeth has given far more to the many persons she has encountered during her life as a Hospital Sister of St. Francis.